New collections are highlighted in light green. Gathered from rare corners of the earth, Michou’s Harmonics collection is an arrangement of elegant techniques played out in radiant musical chords. 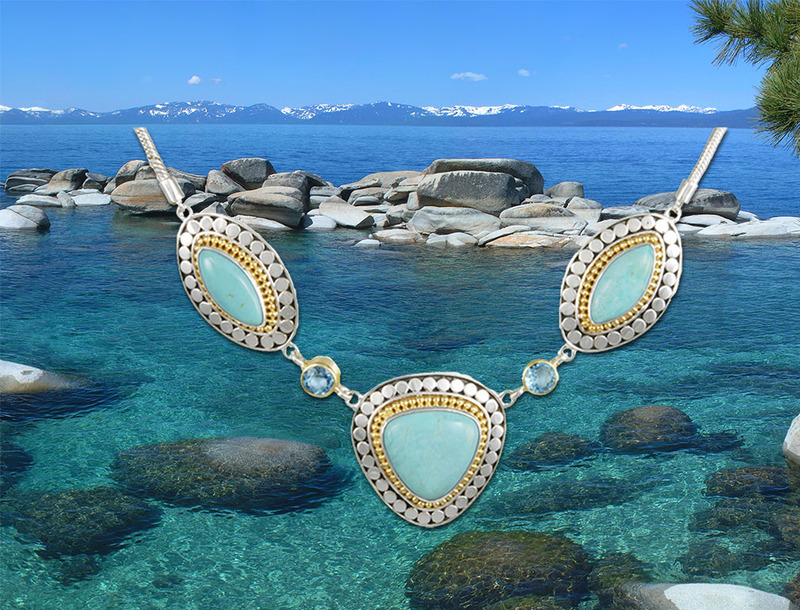 In the first movement of this ongoing collection, the focal point is a melody of large, voluptuous stones in rare Caribbean Larimar and Russian Eudalite - one the color of clear blue seas, the other of dark green forests and wild raspberry. Intricate patterns dance in musical symmetry around each stone: a sleek golden bezel captured within golden beads of granulation inside a slim outline of cool silver embracing fine strands of twisted gold braiding offset by the gleam of silver framework...each element building in mathematical precision against the graceful flow of notes. Smaller elements - drop earrings, rings, and loose necklace strands - balance more exotic pendant and earring centerpieces with milky opal and pearl against translucent notes of hot pink and blue topaz. Michou’s Harmonics will continue to adapt the inspiration of generous stones against a chorus of smaller complimentary notes using different techniques. Look for a harmonious balance of contrasts, homage to the ancient secret society of the Pythagoreans, who worshiped mathematics as art form rather than science, a musical gift from the gods.